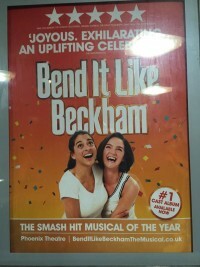 10 years after the celebrated film, Bend it Like Beckham the musical hit the West End stage and began previewing at the Phoenix Theatre, London in May 2015 running for over 9 months before preparing for international tours. The original book was written Gurinder Chadha and Paul Mayeda Berges, the music is composed by Howard Goodall with lyrics from Charles Hart. 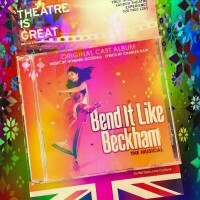 Here are a selection of videos from the show including the West End trailer; UB2 video; the making of the UB2 video; Gurinder and Howard talking prior to the launch; the ‘Coconut Ceremony‘ on 1st day of rehearsals; 1st week of rehearsals; from the director half way through rehearsals; backstage at rehearsals; Howard Goodall introducing the Sitzprobe; cast arriving at the Phoenix theatre; West End opening night report; at the 5th Asian Awards and Jamie Campbell Bowers interview both at the Asian and Olivier Awards; BiLB Harriers training with Tottenham Hotspur Ladies’; at the Olivier Awards and 2015 Children in Need performance. 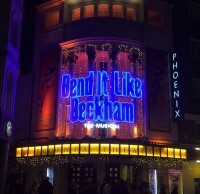 With thousands of followers and likes, follow the fun through Bend it Like Beckham’s instagram and facebook pages.